One of the most important events of your life might just be your wedding. It also might be one of the craziest, disorganized, mixed-up times of your life too. We’d like to help with that a bit with a free wedding theme we call Forever. 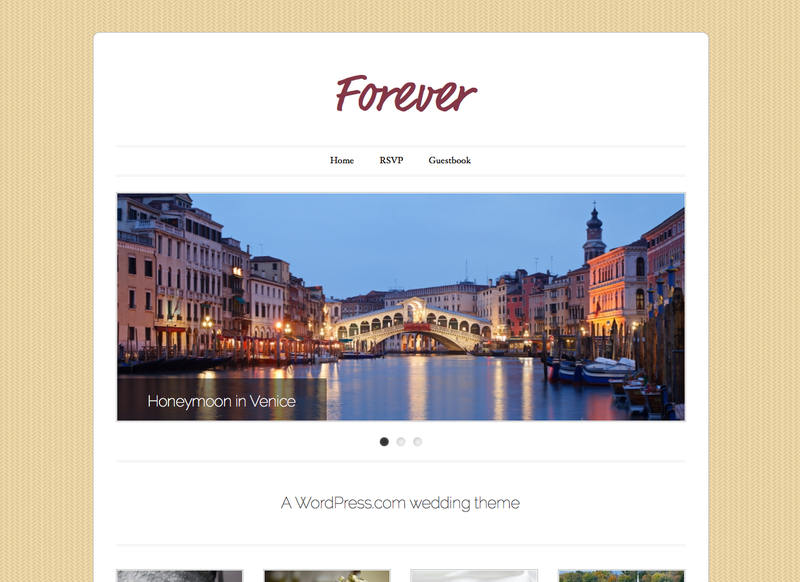 Along with a handful of cool features we’ll get to below, Forever makes it easy to wrap your wedding up in a neat little blog on WordPress.com. You can show off every one of your best photos and highlight every important detail leading up to the big day and beyond. Forever makes it easy to welcome your family and friends to your blog with a dramatic personalized home page. The design is bold and clean with lots of room for large, colorful photos of the happy couple (that’s you!) in an optional featured post slider and home page excerpts. You can also easily customize the color scheme and get Forever to match your wedding colors with only a few clicks. You can update the background color (or add your own pattern) from the custom background page in your blog dashboard and even change the color of the all the links from the Forever Theme Options page. We also built in a special Guestbook Template that lets your guests take over a page of your choice with their best wishes for you … and maybe a few embarrassing stories 🙂 … as comments. And, of course, Forever works seamlessly with all the other WordPress.com features you love; emails sent to your blog followers every time you post, contact forms (perfect for RSVPs), custom domain names (like robandlaura.com instead of robandlaura.wordpress.com), customized fonts and CSS with the Custom Design upgrade (great for changing your blog title to a handwriting font), and everything else. And it works especially well with our new Milestone Widget. Forever also sports a custom design for a new widget we call Milestone. You can find it in your blog dashboard at Appearance → Widgets and it’s pretty easy to use. Just pick a title for your event, a date and time, and a special message for the big day, and you’re ready to go. Now you have a special save the date widget for your Wedding on every page of your blog. If that sounds pretty awesome and you want the Milestone widget available for your non-Wedding blog too, you’re in luck. We’re also making the milestone widget available to every theme on WordPress.com right now. I love this but wish it had been around in early 2010 for my own wedding 😉 Looks great though guys. So many of the wedding websites out there right now are so hooky looking. Yay for a milestone widget – Thanks! Will the “Milestone” widget be made available via dot-org? Yep. We’re working on it. Look for it in a future release of Jetpack. There should be a wedding counter to make it truly complete. Awesome addition, I’ll also have to tell some of my clients about this. This is perfect since I was already using WordPress for my wedding website — i just made the Chunk theme work until 2 minutes ago… this theme is wonderful. Thanks! The theme, however, is stunning. Nice work as always! So, where were you in 1983? Fortunately, we’re still married… We eloped. Been thinking about a real wedding to renew our vows. Hmm… Maybe I’ll start my blog today? Whilst I have no weddings going on in my life right now, this theme with a dark background suits my blog really well so I am going to use it anyway. What a wonderful theme idea. Wish it (and the Internet) had been around when I first got married. And hurray for the Milestone widget. I’ve often wished for something like that. Can we get the “milestone” widget on other themes? Yep! It’s available for every theme on WordPress.com. This is more than important, love it. Check out our new gorgeous wedding theme. Can’t wait to get started with it. Major kudos to our Theme Team! I have a blog about Home decor & DIY, so I Forever wouldn’t work for me – it looks great though. Anyway, I just wanted to tell you how much I love the way you presented the theme. The last phrase was awesome “Here’s to your wedding and your wedding blog on WordPress.com. Cheers! (That means you have to kiss now. )” haha Very creative! So can we specify in a Milestone widget for a time period, as long as it’s a few consecutive days? Instead of just 1 day. I was just thinking for an event that runs over 2-3 days and make the countdown start from the lst day of event? Right now, it’s just one point in time and not a range. There’s always an occasion for WordPress. Awesome. I’m with Sara, although I wasn’t blogging when I had my wedding! Love the new widget and will definitely find a way to use it! Great. Let’s get married! Can I marry WordPress? Absolutely. WordPress is a catch. Will I be able to get this theme on .org? Yep! It will make it’s way there soon. Wow, this is great ! What a timing. My friend was just asking me for suggestion for a wedding site, well, what better than a super easy to setup/use interface, ad-free, free, blog with a custom theme on wordpress. I am not going to search any further. I need help making some of the features work, but there is nothing in the forums or support about this theme yet. How can I get help? There are instructions on setting up Forever in the theme showcase but if you run into any trouble you can always contact us in support at anytime. Brilliant Idea. Wish this had of been around when we got married two years ago. It will make the planning a lot easier for couples. Beautiful and simple! Love them! Very Cool. Perfect for weddings. Good Luck for your Widget. Good luck on the new phase of your life! I LOVE this new theme!! I’m not planning a wedding but its elegant simplicity suits my Greek painting/travel/photography blog perfectly! Just what I’ve been looking for, so – THANK YOU! I agree with Mark and Yvonne. This is a beautiful theme and there’s no need to get engaged to use it! Theme team, you rock! The new themes look great… I know many people each year who get married and I will have to let them know about this. Love the idea of the milestone widget – thanks! What I like most is the “Milestone widget”. Wow, that is fantastic. My cousin got married not long ago, and I wonder if she would have used this theme? I really like the new widget, and I expect I’ll be able to use it soon (though not for a wedding). Thanks. I really like this theme. Would you say it would work for all events…not just weddings? Sure. Try previewing it from Appearance → Themes and see if it fits your content. If it works, it works. This is a very nice theme and fit more than just wedding ..I have juse it for my flower blog Fleurs du Monde…and so THANKS for all your great themes….WP rocks!!!!!! I do, WordPress, I do. Love this theme! When will it be available for wordpress.org users? Forever should make it’s way to the WordPress.org site sometime in the near future. Nice theme, simple but elegant. What a great theme! I doubt if I’ll ever need to use it, but I bet those who will use it, will be very happy with it. This theme is really cool. I’m not getting married anytime soon, but I love the milestone widget. It’s really cool and I cant wait to use it for my next big event. Awwwww, that’s really nice. I need to get married now so that I can use it! Nice!! I might try this if it is free! 🙂 Thanks for simple and lovely theme! LOVE this theme!!! I’m using it for my everyday life blog, beka stays, and just waxed poetic about how wonderful it is here. Just want you to know I grabbed this theme for the makeover for my quilt blog. It’s a winner. I am using the Milestone widget to count down to local events that relate to quilts. I love the width of the column as it allows me to post up large-sized photos of quilts, and the font style is great looking (just wish it could be a titch larger for many quilters are older). I like the look, the layout, and how clean-looking it is, even with lots in the sidebar. Thank you, thank you! Wooooow. It is Gorgeous. Ballerinic, “OMG” i can’t believe this. It will be available for WordPress.org users sometime soon. THANKS…! I have really loved this. What a wonderful idea. Now if only this theme would make marriage legal in my state, it’d be 100% useful to me. Nice! Best of luck on the big date!